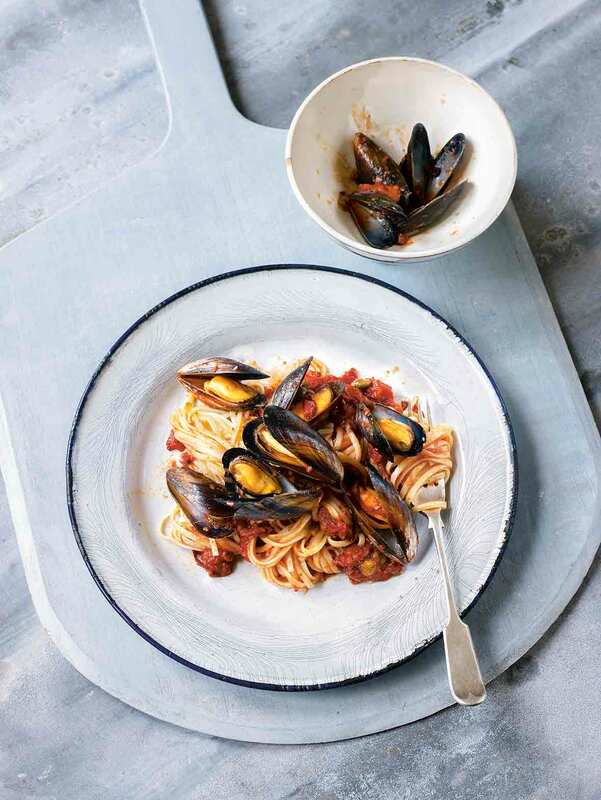 Mussels in a red dress is a simple, elegant meal of linguine topped with steamed mussels and a classic sauce of red wine, tomatoes, olives, capers, and basil. 1. Scrub the mussels, pull off all the beards, and discard any open mussels that do not close when tapped. 2. In a large skillet over medium heat, warm a splash of oil. Add the garlic and chile and cook, stirring, until fragrant but not browned, 1 to 2 minutes. 3. Add the tomatoes, tomato paste, capers, olives, and wine. Simmer, uncovered, stirring occasionally and breaking up the tomatoes, until the sauce is thick, 20 to 25 minutes. Add the salt. 4. Bring a large pot of salted water to a boil and cook the pasta until al dente, then drain. 5. While the pasta cooks, fill a large pot with just enough water to cover the bottom by about 1 inch (2 cm). Place it over medium heat. Add the mussels, cover, and cook until they open wide, 3 to 6 minutes. Transfer to a bowl. Discard any mussels that remain unopened after 6 minutes. 6. Add the basil and pasta to the sauce and gently toss to combine. Divide the pasta among 4 plates and pile the mussels on top. 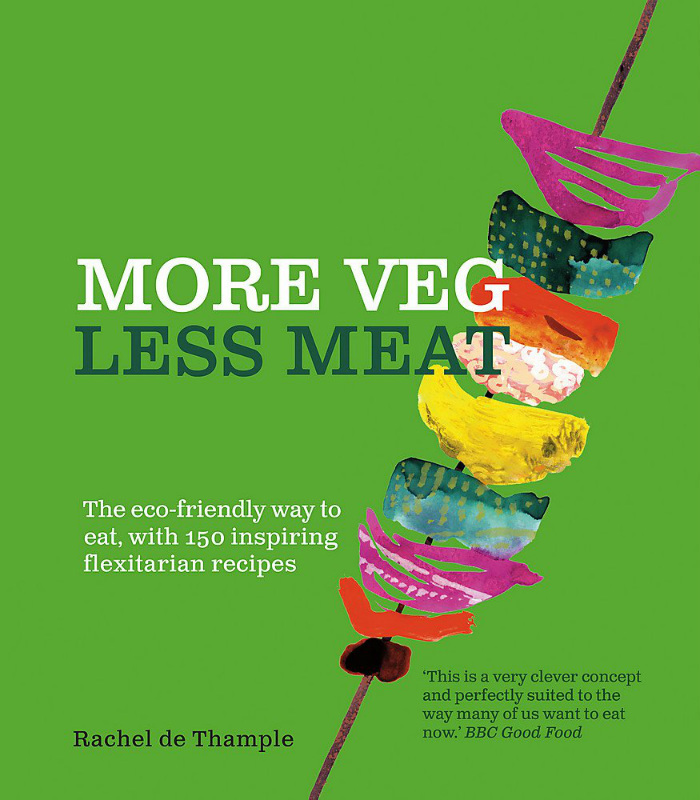 Mussels in a Red Dress Recipe © 2018 Rachel de Thample. Photo © 2018 Peter Cassidy. All rights reserved. All recipes and photos used with permission of the publisher. I’ve never made mussels before so it was a confidence booster for me to learn how to make them. They are a nutritious, fast-cooking protein and they’re easier to make than one would think. My young children even ate all of their mussels! The tang of the capers and the Kalamata olives really shine through to make this a delicious sauce. I think that this sauce would be equally delicious with grilled or sauteed shrimp. I used baby grape tomatoes as my choice of fresh tomatoes. If I use them again I will cover the sauce with a lid for the thickening step so that they burst more easily. I used a Tuscan Sangiovese and linguine noodles. If you like pasta puttanesca, you will love Mussels in a Red Dress. They are practically the same dish but instead of anchovies you have mussels. The mussels truly take the dish to another level. Not just in terms of flavor, but the dish becomes more substantial and, in my humble opinion, a lot more fun to eat. I used 3 Tomatoes on the Vine and red Burgundy wine. We loved this! The mussels were perfectly steamed and the briny tomato sauce with pasta was the perfect base. Simple enough for a weeknight but definitely impressive without breaking the bank. As a bonus, even my 9 year old gobbled it up!